Established in 1954 with the help of Korean immigrants in Hawaii, Inha University has produced highly talented graduates who have contributed to the development and modernization of Korea for the last half century. Needless to say, Inha University continues its educational and research endeavors, the two most important responsibilities of a university. Looking toward the future, Inha is now concentrating all its efforts to become a world class university, while continuing to contribute to the development of the local community. Interdisciplinary studies have become a new trend these days. In this era of rapid and revolutionary change, universities are facing many challenges and opportunities. Inha is committed to meeting those challenges and is dedicated to fostering the creativity and innovation of tomorrow’s leaders. Today, Inha boasts 11 colleges: Engineering, IT Engineering, Natural Science, Economics and Trade, Business Administration, Education, Law, Social Science, Humanities, Human Ecology, and Medicine, and 54 departments. Inha University’s Graduate school offers master’s degree programs in 51 fields and 45 doctoral programs. The Graduate School of Education has 22 master’s programs and research courses. The Graduate School of Business Administration offers two MBA programs and a business management course for executives in addition to offering a part-time MBA program. The Graduate School of Engineering offers 12 programs and research courses. The Graduate School of Public Administration has five programs and research courses. Founded in September 2006, as the first school of logistics in Korea, the Graduate School of Logistics offers a Global MBA and doctoral programs in logistics, and the Law School offers master’s and doctoral programs in law. Today, Inha University is making its utmost effort to foster professionals with academic knowledge and skills and a character befitting the school motto of “Truth”. Inha has already produced as many as 160,000 graduates who are now leaders in industry, science and technology. With a student body of 20,000 students, Inha is continuing its efforts to become one of the top universities in the world. Inha is ever doing its best to improve so students can enjoy the college life and have pride in their school. All Inha professors make the greatest effort to provide students with the best lectures and to foster talent by focusing on additional special lectures, internship, e-learning, and overseas exchanges. In addition, we believe in a balanced education that includes the liberal arts, far too often forgotten in an increasingly digitalized world. Inha has a firm belief in that the true purpose of a university, the development of human spirits, lies not in the quantitative and external expansion, but in the realization of human values and the nurturing of creativity. Motivated by our prominent tradition, all at Inha will never stop their efforts to fulfill its mission as a center of comprehensive studies and arts. April 9, 2015. Ranked as the Best University in Industry-perspective University Evaluation by the Ministry of Education in the areas of energy, environment and biomedicine October 28, 2014. Construction of 60th Anniversary Memorial Hall begins. October 2, 2014. Inha University in Tashkent(IUT), Uzbekistan is opened. 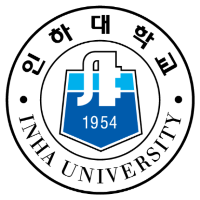 Founded in 1954 to fulfill the dearest wish of empowering and bringing prosperity to the nation, Inha University stands for the Ideals of building students' characters, searching for the truth and serving society in order to embody the University's founding principles of creativity, diligence and service. “Truth” the school’s motto, indicates we as a research university endeavor to contribute to improving the nation as well as all human society, to embark on great ventures into the world, and to attain academic achievements in our quest for truth through continuous education and training. On the basis of the above ideals, we strive to attain the following goals to build character in our students, foster healthy ideas, and achieve our educational objective of cultivating talented individuals who will contribute to the development of the nation and human society by studying profound theories and applying them in reality. We strive to cultivate these qualified leaders by offering a diverse general education program to equip our students with knowledge, morality and deepening multi-disciplinary scientific knowledge and technology. We endeavor to develop a practical field of science so to hold a prominent position academically and internationally. Since we are located in the Incheon Megalopolis, which is positioned on the geographical axis of the Northeast Asia, we have the potential to lead our nation’s future and to assume the role of the key source for higher education in the area. To realize the school’s educational ideals mentioned above, all colleges have set academic goals and directions. Departments and majors within each college have also set their own educational goals in connection with their colleges’ goals, in order to structure, systemize and fulfill the school’s educational ideals, objectives and goals in the real world.